How does the man do it? Seriously, Justin K Broadrick is a goddamn machine. As if conceiving some of the most godly music in his primary musical vehicle, Godflesh, wasn't enough, he has also worked in and instigated equally powerful and challenging music in a series of side projects. 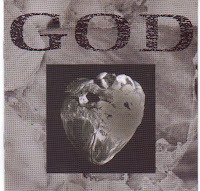 One of the best being the mysterious but totally captivating, God, a nine man ensemble that featured Kevin Martin (Techno Animal, Pathological Records), John Zorn (Mr Bungle, Naked City), and not one, not two but three bassists (one being a double bass). The result was not simply a record, it was a musical world, drenched in the horrors of urban decay, urban struggle and urban depression. In terms of the band's background, they debuted in 1990 with a 12 inch entitled 'Breach Birth,' then followed that up with 'Loco,' on Martin's label, but for this record, they somehow secured a deal with Virgin records, I wonder if Richard Branson was even aware of this investment?? And if anyone has any details, or stories related to this band, please, please, let me know!!! The band would go onto release one more hellish full length 'The Anatomy Of Addiction,' in 1994, and again, it was another cold, alien blast of primal human emotions that stupefied as much as it intrigued. Unfortunately, as this record has become horribly out of print, it has also attached seriously inflated prices on the likes of http://www.ebay.com/ and the marketplace at http://www.amazon.com/, however I do recommend this record, so keep your eyes peeled on those outlets for a cheaper copy to come along, or perhaps a better move would be to root among the bargain bins in your local record stores...?? ?